The [tag]stack offense[/tag] is one of the oldest [tag]basketball offenses[/tag] that is still occasionally used in today’s game. This offense utilizes a strong ball control guard who quarterbacks the entire offensive set. The stack shouldn’t be run unless a team has a guard who has exceptional [tag]ball handling skills[/tag]. This is a quick-hit offense that usually takes one or two passes, and maybe a bit of dribbling on the part of your ball handler in order to open up some of the plays. It is primarily played against a man-to-man defense. • It is tough to play man-to-man against this offense. 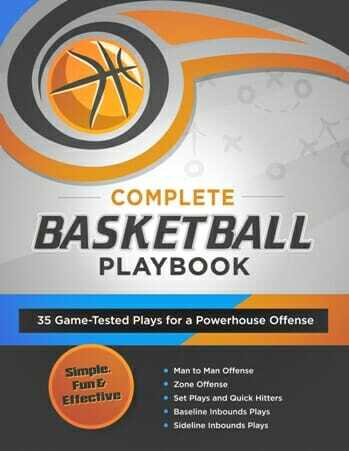 If a team switches to zone on you during the game, it would be an opportune time to try out the perimeter defense from earlier in this book! • Good offense for rebounding. You have four players in the key area, with your big players usually there to get the second and third chances at the ball. • This offense can be set up to exploit mismatches against the opposition. If you change where a player plays their position, then this can provide problems for the defense. For example, if you move your big post player to an outside position, you can take one of the opposition’s big players out of the rebounding area. • They say that if the players are able to execute this offense well, then it would be impossible to not get a good shot. This is the first offense we have talked about that you should select players suited for the positions. 1 man – This player needs to be your best all-purpose player. 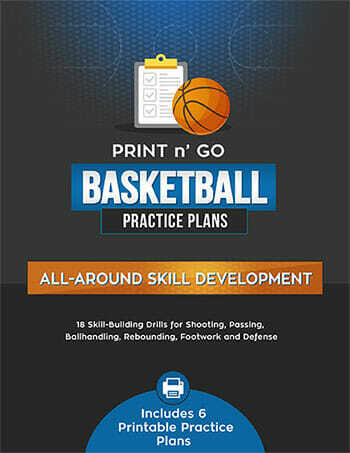 He or she needs to be able to dribble, pass, make quick plays, shoot the deep ball, and also get back to play defense – quickly. 2 and 3 man – These players will be your best rebounders and inside shooters. They should be able to execute a variety of post manoeuvres, and also be strong defensive players. Boxing out on the offensive and defensive boards is essential if this offense is going to be successful. 4 and 5 man – These positions should be good outside jump shooters. The basic play structure for the stack offense provides for these players to get the ball in the 12 to 14 foot range. • The 1 man drives to the right, and the 5 man moves at a 45-degree angle out to get a pass. At the same time the 3 man seals the defender to the inside and prepares to potentially receive a pass. After the 1 man makes a pass, he or she goes down to the 4 man to set a screen. – He or she can pass to the 3 man that has sealed off his defender. Then the player makes a post move for a shot. – He or she can take a shot from the outside. All three of the other players down low crash the basket for a rebound. – He or she can pass to the 4 man, who has rotated to the top of the key. 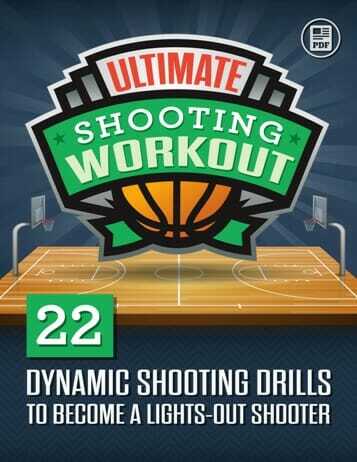 This player can then square up to take a shot from the top of the key, or drive to the hoop. • After setting the screen, the 1 man will rotate back to the perimeter (outside the three point line) and wait to possibly reset the offense. Also, if the 4 man doesn’t receive the pass, he or she will head back down to their position to wait for the offense to reset, or to rebound the shot. If there are no passing opportunities, the 5 man will hold the ball and return the pass to the guard sitting outside the perimeter area. The entire time it takes to run this offense should be minimal – maybe 10 to 12 seconds. The main success of this offense comes in its ability to surprise the opposition. If the ball does get back to the guard at the top of the half court, then the offense should be run the same way, just on the opposite side of the court. • The 4 and 5 man must be prepared to rebound. They will be rebounding short to medium range jumpers more often than drives and short hoops. • Good post moves are essential to this offense. If you can get the ball to the top post players, a good drop step or baby hook can almost guarantee two points. • Since four players are down low on offense, they are quite susceptible to the fast break. Players need to be acutely aware of when their team loses the rebound battle to hustle back on defense. This is a great offense to use as a change of pace. It can be used as an offensive variation for the flex offense or the motion offense if the plays are adapted to work with those philosophies.